The Begin Affair: Love Behind the Headlines. Prime Minister Menachem Begin was a modest man of extraordinary stature. Alisa Begin was exceptionally wise, courageous and caring. Dr. Joyce Starr was blessed to spend personal time with the Begins, to experience their warmth, grace and humanity behind the public curtain. Illuminating the human dimension with private vignettes, the author also includes endearing “Begin” stories recounted by leading US diplomats. 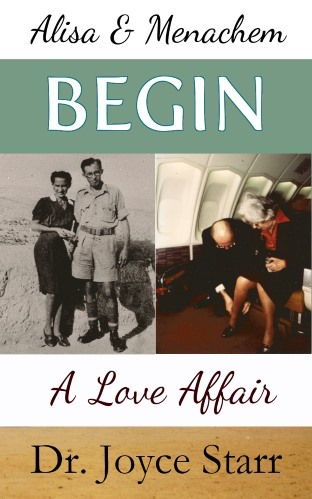 Readers will enjoy touching photos of the Begins during their courtship years. An award-winning author, Dr. Starr has written extensively on Israel and the Middle East Peace Process, including her Kindle books, Israel’s Impossible Era , Israel: A Foreign Affair and Israel Water Wars. Read more about these books in our Israel Series.